“This proves that dinosaurs aren’t dead,” was John Richardson’s colourful and surprised reaction to the news that he had been shortlisted for the SJA Sports News Reporter of the Year at the 2018 British Sports Journalism Awards. Well, it turned out to be the year of the dinosaur for Sunday Mirror’s Ricco, who has kindly agreed to answer a few questions for us. Many congratulations on being named Sports News Reporter of the Year at our SJA awards night. How much of a surprise was it? A: It certainly was because those who were there would have noticed that I struggled to find the steps to the stage and definitely didn’t have a speech prepared. To hear my name called out as the winner was one of the biggest shocks of my life. I was honoured to have been among the six nominations – all of the other five deserving of the award for their outstanding work and all of them journalists I like and admire. What were the story or stories you were most proud of in 2018? A: Probably Steven Gerrard and Gary McAllister definitely joining Rangers because everyone in the industry knows that you are told something by contacts which is true but at the 11th hour can turn to dust. For this story I had an anxious four-day wait until it was confirmed. There was no wriggle room – my back page story had said WILL join and not COULD. We’ve all been there haven’t we!? The Wayne Rooney story leaving Everton could also have come back to bite me on the derriere because at the end of the season there was a change of manager and that could have changed the dynamic concerning the player leaving. Thankfully it didn’t. How did your career start? Was becoming a sports journalist always the plan? A: One of the good things about being a paper boy at the age of 13 was that I would look at all the back pages, being a keen sports fan. I would look at the by-lines and think covering football matches for a living couldn’t be bad. So really from being a young teenager my mind was made up. I stayed on at school to take my A levels and although they were good enough for a university place there was no way I wanted to spend three years on a degree when the chance of being a journalist was there – much to the annoyance of my parents. I wrote to a number of local newspapers and hit lucky with the Chester Chronicle who even better had a six-month journalism course, together with other papers in the group in Newcastle. You went on to work for The Daily Mail in Manchester, The Sun in the north east, back to the Daily Mail before being appointed chief football writer of The Sunday Express – a great reward for your talent and dedication. What did it mean to you? A: I honestly have enjoyed every moment of being on a national newspaper, visiting so many countries and being amongst fantastic colleagues. I think what was also important, and I still believe this for any aspiring young sports journalist, was that for the first three years of my career I was a news reporter. That gives you an important foundation and a sense of perspective and reality when covering sport. Who, among sports editors, and others, have most helped you along the way? A: This is very difficult because so many people have helped me and they still are. 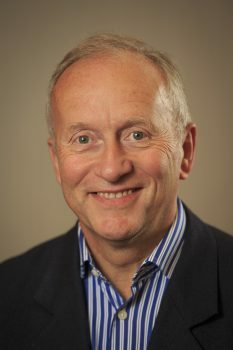 My first sports journalism job was with the Brighton Evening Argus and, led by the sports editor John Freemantle, the small group on the sports desk knocked me into shape. Then on to the Birmingham Evening Mail where I was fortunate to work under an inspirational Ray Matts who went on to the Daily Mail and Dave Harrison who has remained a close pal. On the Newcastle Journal it was work hard and play hard. The play-mates on the trips around the country included Paul Hetherington, lately of the Daily Star Sunday and Alan Oliver. The only problem was Saturday always followed Friday night. It’s a wonder we got to some games. My ambition to join a national newspaper was realised by the Daily Mail where I was quickly told by my sports editor Bryan Webster to not try and write like Ian Wooldridge. He encouraged and cajoled in equal measures – so much so that The Sun quickly made me an offer. Peter Fitton was the main man in Manchester and I was privileged that he took me under his wing. He was a great operator, one of the best, and I learned so much with David Balmforth, the sports editor, giving me licence to develop. A return to the Daily Mail was followed by Mike Allen offering me a job as chief football correspondent of the Sunday Express. Which sports journalists have you most admired, and why? A: I used to cut out Michael Parkinson’s columns from the Sunday Times and many were plastered on the wall of the Chester Chronicle office as I sought inspiration. Ian Wooldridge was someone I never missed reading. Ditto Patrick Collins. I enjoyed everything about James Lawton, except his ruddy fags when smoking was the curse of the press box! Thankfully there are many younger wordsmiths who have taken on the baton of quality writing. 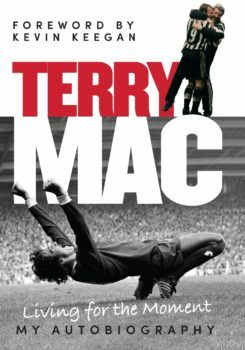 Has anyone, outside sports journalism, been an inspirational figure to you? A: I have always admired top musicians and if I hadn’t been a sports journalist I would have loved to have written about music. Sadly, the likes of Melody Maker where I enjoyed the word of Richard Williams, a charming man who I luckily got to know as an outstanding sports writer, and the NME are no longer. So I would be struggling now! The fact that Bruce Springsteen can belt it out for three and a half hours as if it’s his first-ever concert is a lesson to us all to try and do our best at all times. Which managers and players have you enjoyed the best relationship with? A: I’ve been very fortunate to have enjoyed many fantastic relationships, right from my early days of covering non-league football in the Brighton area. My biggest break was being Paul Gascoigne’s ghost writer on The Sun. Safe to say there was never a dull day and you were never safe if you happened to fall asleep with Gazza around. Kevin Keegan was an absolute godsend for any sports journalist. Covering Newcastle in the Keegan years was an exhilarating ride. It’s where I became big mates with Terry McDermott and I helped him write his autobiography. Following Wales was another joy, especially the Terry Yorath years. I’d already become friendly with Mickey Thomas and soon I could classify the likes of Ian Rush, Kevin Ratcliffe, Gary Speed, Robbie Savage, Chris Coleman and John Hartson as more than just people I dealt with on a professional level. As you can imagine, dealing with Sir Alex Ferguson had its moments but it always produced headlines and we had some great off-the-record chats. Burnley manager Sean Dyche is old school and is prepared to go off piste. I recently enjoyed writing an article on his love of music. News, opinions, interviews, reporting – which have you enjoyed most? A: I enjoy all the strands of the job. I just wish more space would be given to real cutting-edge interviews. Too many papers believe the reader can’t take in more than 600 or 700 words. But there’s nothing better than the adrenaline flowing when you are up against a deadline for a match report. Then, of course, there’s the excitement of breaking a story – an art which is becoming more and more difficult. As a dinosaur, I would rather see this happen in a newspaper rather than online. A few years ago, like too many of the best in our industry, you were made redundant. What was the effect of that on you? And how did you respond? A: I felt physically sick when I opened up the envelope which revealed I had been selected for redundancy. I didn’t feel I deserved it because I was still enthusiastic in my work and I know it astonished many people. I can still hear my wife Sue saying “Are you just going to sit there and feel sorry for yourself. Go out and prove yourself again.” So, I did. You did – with The Sunday Mirror. How did that happen, and how important was that? A: After being made redundant the response from the industry was unbelievable, something I will never forget, but it was an old mate from my Daily Mail days who came to the rescue. What has been the effect of social media on sports journalism? A: I’m not a fan of it but social media is so important these days. For your profile you have to be on it and stories often break on it. Generally, I think much of the stuff on social media is negative and can be nasty. I’ve learned: don’t tweet with a few beers on board. It can come back to haunt you. You follow Chester and Newcastle. Chester is your home town, but why Newcastle? A: Chester is the club I have followed since I was seven but at 18 I went to Newcastle for six months as a trainee journalist and entered St. James’ Park. That was it. I was hooked even though in those days St. James’ Park was crumbling. The whole city lived and breathed football. You couldn’t get away from it. Later, I arrived on The Sun to cover the Keegan years so my membership of the Toon Army was well and truly stamped. 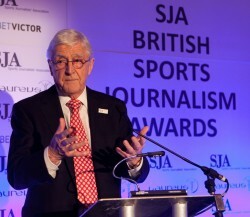 And, finally…our SJA awards event was attended by a group of young sports journalism students. What would be your advice to them when they head into the world of work? A: It’s all about drive and enthusiasm. It is a very demanding job but if you put everything into it you will enjoy the massive rewards. It doesn’t have any hours and creates havoc with your social life but there again at times it will add to it. There’s no finer job.